Being a couple who are in love to each other is not enough to make a decision to get married in Balinese culture. There are many other things that need to be considerate. There is a saying in Balinese culture which means “ You are not only marrying the bride, but you are marrying the family as well”. This saying means, once you married your partner, you will have responsibility to take care of their family as well. That is why, many married couple still live with their parents because they have to take care of them. Similar with Western culture, the wife has to follow the husband’s name. While in Balinese culture, the wife has to follow the husband’s caste. If the husband has higher/lower caste than the wife, the wife will be upgraded/downgraded to the husband’s caste. Normally. for the higher caste Balinese, they deliberately look for a partner who are from the same caste to be able to continue their blood. 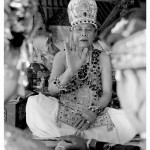 Read this blog post to know more about Balinese Caste: Why Balinese Have Same Names? The first possession before the wedding is to meet the parents. Both sides of the main family members will meet to know each other and to make arrangements for the future plan. When the decision has been made, then the big families will meet, this profession is similar with engagement, however it does not involve any engagement ring. Then, it is time to choose the good day for the wedding. Choosing the good day is unlike choosing any days or dates you want. They have to go to a certain person who is from the highest caste of Brahmana who knows about Balinese astronomy. Once the date is chosen, they start to prepare the pre-wedding ceremonies. The pre-wedding ceremonies started with family members from the groom side come to the bride house to ask permission to “take” their daughter to move to the groom house, and for the bride to leave her family temple. This ceremony called Ngidih, in English translation means “ask”. Then, on a different day another ceremony is held at the groom house to “welcome” the bride as the future new family member. Then, the bride is officially moved to the groom house and she is also officially moved to the new family temple. Those ceremonies are normally taken place at their home town where their family temple is located. Then, they are ready for the big day. The wedding ceremony is normally held at the groom’s house in the home town, not in a ball room or special building. The wedding ceremony is normally attended by the family member, relatives and neighbors. Unlike western wedding which the bride wears white wedding gown and the groom wears suite, Balinese bride and grooms wear colorful wedding costumes with many attributes that has its own philosophy. Their wedding costume is not chosen by themselves, but it is already chosen according to the caste of the family. The typical material of Balinese wedding costume is Songket, with Golden threads layers, the color of the material is normally bright colors like blue, yellow, orange or red which represent happiness and celebration. The luxurious Songket also shown how wealthy the family and how high the level of the caste is. Other than the dress, the groom wears some kind of head cover that tight to the head while the bride wears some kind of crown with golden decorations. The higher the crown, the higher the caste of the family is. Are you interested in Balinese wedding costume and want to try one? Lagoon Spa Seminyak has Balinese Wedding Photo Session. You and your partner will be dressed in a traditional Balinese wedding costume, their staff will provide the make up and hair do and help you to wear the costume, and they will have a photographer taking photo of you and your partner. Add collection of your wedding photo wearing Balinese wedding costume. 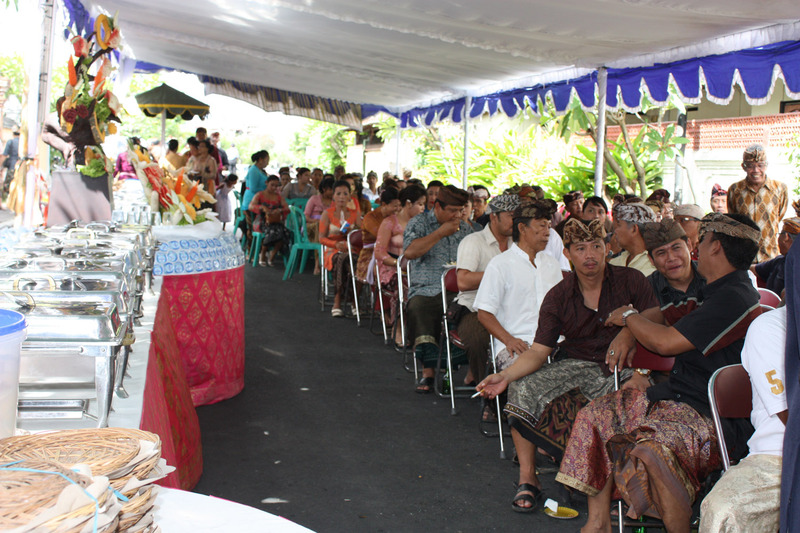 After all the long processions, the last part of the Balinese wedding is the wedding reception. 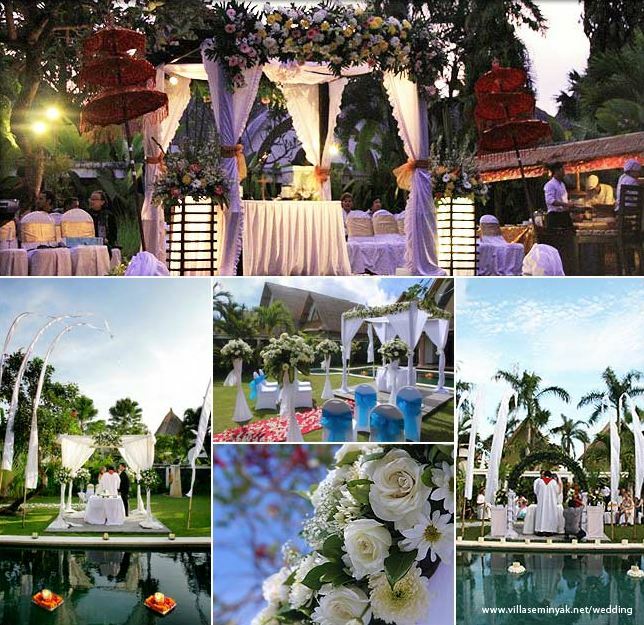 Normally, the Balinese wedding reception taken place at the house of the parents in their hometown. They will set up decorations using palm leave around the reception area. The venue is normally the front yard of the house. They set up a tent with lines of chairs or carpets on the balcony for the guests. They serve food that are normally in buffet style. It is practical and easier to serve since there is no table for the guests. They don’t use normal plate, but they use a traditional plate made of woven rattan with rice paper. The wedding reception normally lasts for the whole day so that the guests have flexibility of time to come to the wedding according to their availability. In the very traditional family, the wedding presents are normally in a form of goods that useful for the household (glasses, bed sheets, plates, etc.) while in a more modern family, the wedding present is in a form of money. To organize the Balinese wedding ceremonies and reception, Balinese don’t really use any wedding organizer, but they normally get help from the people of the village. That’s how the community works in Bali, people help each other every time they have some events in their village. So, do you like this article and find it interesting? If you do, click SUBSCRIBE to be the first one who get the latest blog post!